Artist’s illustration of NASA’s Transiting Exoplanet Survey Satellite (TESS) in front of a lava planet orbiting its host star. TESS, which is scheduled to launch on April 16, 2018, is expected to identify thousands of potential new planets for further study and observation. TESS is in the home stretch. NASA's next planet-hunting spacecraft — whose full name is the Transiting Exoplanet Survey Satellite — is scheduled to launch on April 16 aboard a SpaceX Falcon 9 rocket from Florida's Cape Canaveral Air Force Station. "TESS is opening a door for a whole new kind of study," TESS project scientist Stephen Rinehart, of NASA's Goddard Space Flight Center in Greenbelt, Maryland, said in a statement. "We're going to be able to study individual planets and start talking about the differences between planets. The targets TESS finds are going to be fantastic subjects for research for decades to come. It's the beginning of a new era of exoplanet research." Technicians work on NASA’s Transiting Exoplanet Survey Satellite, which is scheduled to launch on April 16, 2018. If all goes according to plan, the 700-lb. (318 kilograms) TESS will settle into a highly elliptical, 13.7-day orbit that brings it as close to Earth as 67,000 miles (108,000 kilometers) and as far away as 232,000 miles (373,000 km). This orbit — which no spacecraft has ever employed before — is incredibly stable, allowing TESS to stay aloft for decades without performing any engine burns, mission officials have said. TESS will spend its two-year prime mission using its four special cameras to hunt for "transits," the tiny brightness dips that result when alien planets cross their host stars' faces from TESS' perspective. This is the same planet-hunting method used by NASA's Kepler space telescope, which has discovered about two-thirds of the roughly 3,700 known exoplanets. But there are some big differences between the two missions. 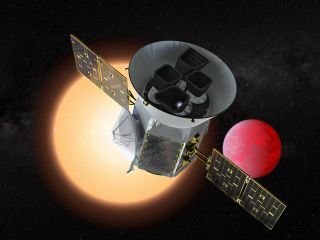 One is cost: Kepler's price tag was about $600 million, whereas TESS is capped at $200 million. In addition, Kepler stared continuously at a single patch of sky containing about 150,000 stars during its primary mission, which ran from 2009 through 2013. And those target stars were relatively distant — generally, more than 1,000 light-years away. TESS will conduct a broader survey, swinging from patch to patch over two years to cover about 85 percent of the sky. And TESS will be targeting nearby stars — ones that lie within 300 light-years or so of Earth. The new mission is expected to discover thousands of new planets, some of which will be close enough to be studied in detail by other instruments, such as NASA's $8.8 billion James Webb Space Telescope, which is scheduled to launch in May 2020. "With those larger telescopes, we'll be able to look for telltale signs in the atmospheres of those planets that might tell us what the planets are made of, and perhaps even whether they have the kinds of gases in their atmospheres that, on Earth, are an indication of life," Paul Hertz, Astrophysics Division director at NASA Headquarters, said during a news conference today (March 28). "TESS itself will not be able to find life beyond Earth, but TESS will help us figure out where to point our larger telescopes in that search," Hertz added. While TESS is focused on exoplanets, researchers around the world will have the chance to use the spacecraft at times to investigate other cosmic objects and phenomena via a "guest investigator" program, NASA officials said. "I don't think we know everything TESS is going to accomplish," Rinehart said in the same statement. "To me, the most exciting part of any mission is the unexpected result, the one that nobody saw coming." The TESS mission is managed by NASA Goddard and led and operated by the Massachusetts Institute of Technology. TESS principal investigator George Ricker is based at MIT's Kavli Institute for Astrophysics and Space Research.